Well, better a little late than never. I do have to thank Ms and Fabulous http://msandfabulous.com for doing this for me. I love reading her. It’s been really good for me to think about some of these questions. I started my blog because I have always had a journal/diary whatever. As I’ve previously said in a way this is my Midas in the bulrushes moment. It’s my way to vent and to process. Ok, and to share. La vie en rose, of course. So many to love. It can be seasonal. Things I like Key Lime pie, Christmas pudding, trifle, cheesecake. My current favorite mango coconut sorbet. Again, so many to choose and so many to love. Well, Dickens at the top of the list. So, I am thinking David Copperfield. A Little Princess or The Secret Garden. Hmmm.then….. Amy Tan is wonderful, Joanna Trollope, Ruth Rendell, Laura Lippmann, recent loves. Maya Angelou – I Know Why the Caged Bird Sings. The Last Picture Show – Larry McMurtry. Anything by Gail Godwin. Barbara Pym – definitely shaped my consciousness. Oh three so doesn’t work for me. My favorites are transitory. Movies I watch again and again…. Forrest Gump – I even paid to see it three times. “The Object of My Affection,” I keep on coming back to Easy Rider. Did I love Peter Fonda? “The Secret Life of Bees”, “Jean de Fleurette and Manon”. “Breaking Away” – struggling to find yourself and recreate yourself. Next week or next month, maybe a different answer. What is your favorite home-cooked meal/comfort food? These are hard questions. Eggplant parmigiana. Stuffed flounder. Solid Cadbury chocolate is comfort. If you could speak another language, which one would it be? Uh but I do. I love French. I wanted to take Latin and my parents put down their feet and I threw one of the few hissies of my life and ended up in French. It changed my life. I have a facility for language and do Italian, Spanish and German. In high school, I wanted to do Farsi and Russian. Japanese would be useful in my job now. Language is like extra vocabulary. I believe knowing only one language is limiting. My father used to make sure I knew how to say “I am American. I need an attorney” in any country I was traveling to. And me, personally, I wanted to be able to understand “Let’s kill that little girl over there”. I have enjoyed the freedom speaking other languages has given me. Super power. It’s always a toss up between invisibility and flying. Right now, flying trumps all. It would be glorious to feel free, soaring and weightless instead of the careful measured tread I have to take. And to be carefree. Peter Pan calls me and don’t tell me he wasn’t a super hero. He must have been the first. What is one piece of advice you would give someone just starting a blog? The same advice that was given to me – take a course. I learned a lot from Blogging 101. The other piece – read other people’s blogs. It helps. Which song would you pick to be your personal theme song? Ah, these questions with no clear answers. I always thought the Rolling Stones “Satisfaction” was my theme song, flawed for obvious reasons. When I was a college, Don McLean’s “Everybody Loves Me Baby” really worked. I was going through a bad time and Bruce Springsteen’s Badlands. “Thunder Road” obsessively and constantly. “it’s a town full of losers and I am pulling out of here to win” (See Levittown (read childhood) comment) but it’s so much more. Hangfire by the Stones saved my life somewhere in the 80’s. Billy Joel’s “Only the Good Die Young” is a consistent theme. I am a Levittown girl. Joni Mitchell’s Cactus Tree and/or Coyote the last few years. Van Morrison reaches my soul – Caravan. Lately, I have been playing the Allman’s Melissa on my ipod and Jason Isbell’s Live Oak. The soundtrack of my life. Is there a theme to all this music, maybe someone else will see it. Which do you prefer: bare lips, chapstick/lip balm, lip gloss, or lipstick? Lipstick. Finally, a definitive answer. But I can’t live without eyeliner! My favorite place to be is on the beach, any beach. I miss the ocean all the time. This condition has stopped me from walking on the beach. I like my chocolate and liquor straight and unadulterated. Read that – not in cake or ice cream. No juice, no soda. Maybe a little ice. I used to fit a terrorist profile in Italy. I was single and travelled all over, staying usually only a night or two, all over Europe. I love to cook. This was unusual for my family as on my maternal side, they had servants and ladies didn’t cook and on my paternal side, well, maybe it was cooking but it certainly wasn’t good. I can’t stand wearing red, pink or coral nail polish. Blues, purples, greens, silvers and golds for me. I hate red roses. They symbolize death to me. Being married and staying married is something I never thought I would or could do. I have a dish fetish. I don’t know how many sets I have now. I moved out of my mother’s because I had seven sets under the bed and in the closet. I am a secret workaholic. I do it in bunny slippers. I am terrified of being a little old lady with cats. If you could be anywhere but here now, where would that be? Is make-up part of your armour? What genre do you like to read best? Last film you saw and why? Did you like high school (or equivalent)? Thank the person that nominated you, and post a link to their blog on your blog. Answer the 11 questions about yourself provided to you by the person who nominated you. Nominate 5-11 blogs that you feel deserve the award, who have less than 200 followers. 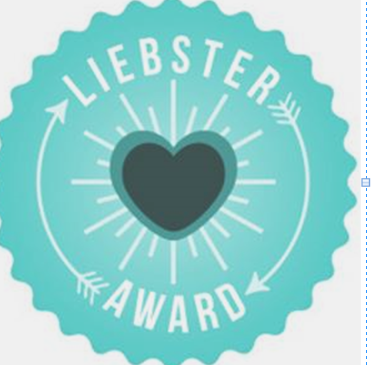 Inform the bloggers that you nominated that they have been nominated for the Liebster award and provide a link for them to your post.